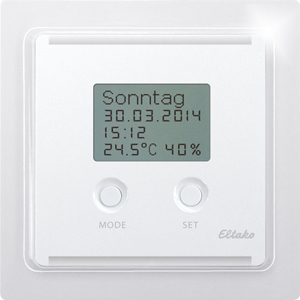 Wireless clock thermo hygrostat TF-UTH with display pure white glossy for single mounting 84x84x14/33mm or mounting into the E-design switching ­system. With adjustable day and night ­reference temperatures and relative ­humidity. Illuminated display. Preset ready to operate. Approx. 7 days ­power reserve. Power supply 230V. Only 0.5 watt standby loss. Smart Home sensor.